THE ACCLAIMED CODEX OF GODS AND DIVINE ORDERS RETURNS! The Book of the Righteous returns! 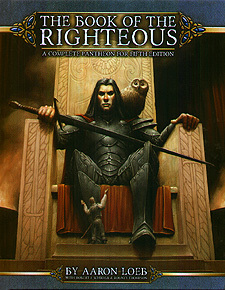 This classic sourcebook presents a comprehensive treatment of gods, religions, and pantheons for fantasy roleplaying. The new edition brings back its epic, original mythology, along with rules updated for 5th Edition gaming. A vast, integrated mythology designed for the needs of fantasy games, from the creation of the universe to hints at its apocalyptic destiny, suited to most traditional fantasy campaigns. 5th Edition rules for new and expanded divine powers, clerical domains, and other abilities for divinely-powered heroes. New rules that provide faith-driven advantages to characters beyond just the clerics of the gods, from the warrior-monks of Terak to the arcane hierophants of Tinel. More than 20 churches to meet the needs of fantasy games, serving gods of justice, war, magic, death, and more - and even churches who serve the entire pantheon, easily usable as the default clerical churches in your campaign. Holy orders, dogma, and prayers to bring religion into everyday life. A complete cosmology, with legendary roles for fantasy races, and well-known monsters. A treatment of evil gods that goes beyond dark lands and black helmets, to provide ways in which the forces of evil can infiltrate even good societies. Story hooks throughout: prophecies, lost artefacts, and unsolved mysteries buried in mythic lore. Advice for using churches and myths in this book, creating nonhuman religions, and dealing with alignment, dogma, and morality. The Book of the Righteous' gods and legends aren't tied to a single fantasy world, and have been designed to be plugged into your fantasy campaign. Use it as-is, or take the elements you need to fill in a character, place, or culture. Each god and religion has been designed in a modular fashion, so that you can customise them as much or as little as you like. OPEN THE BOOK OF THE RIGHTEOUS AND BRING THE GODS TO YOUR WORLD!